Shortly after the invention of the synthesizer technology to reproduce human speech with tuned voices stored in ROM's (integrated circuits) this funny product appeared. Speak & Read uses an electronic voice and programmed activities to help children build reading skills. More than 250 basic words are introduced through activities like "Word Zapper" and "Hear It", helping young children recognize letters and words alike. This educational toy was rated by Texas Instruments for children aged between 4 and 8 years. Don't miss the appearance of the Speak & Spell in the movie „E.T. - The Extra-Terrestrial“. Do you know Qubais Reed Ghazala ? Get more tunes from your Speak & Read with circuit-bending. Don't miss the rare Magic Wand Speaking Reader. This product appeared on the market shortly before Texas Instruments discontinued its Consumer Products Division in 1983. This Speak & Read is an early one. Please notice the gold lettered "Texas Instruments" on the display screen and the large "TI" logo on the keyboard. Later models got a slightly different design. Compare a later model here. 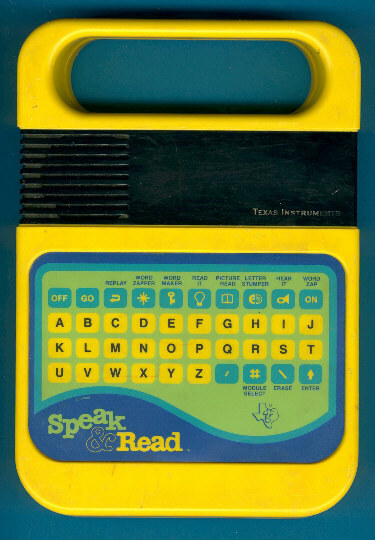 Eight years later the Super Speak & Read with the position sensitive keyboard technology was introduced. 169 Compound words such as shipmate, sunburn, seafood; words ending with er and est; and syllables. 184 The contraction n´t (don´t, didn´t, wasn´t, isn´t). Verbs ending in ed, er, s and es. 143 Rhyming words such as log, dog, pig, big. Plural endings such as boxes, watches, hats and trees. 136 Sound-alike vowel combinations such as ay and ai, ea and ee. Word ending in er and est. 128 Acquaints third graders with words with prefixes, such as re (retold) and un (unkind). 131 Consonant blends such as bl, br, cl, cr, dr, fl, fr, g, pl, pr, sc, sh, sl, sk, sm, sp, st, sw, tr. 172 R-controlled vowels such as ir, ar, er, ur, or; and words with suffixes ful and ly. 133 Silent letter combination such as chalk, phone, limb; and suffixes less, ous, and able. Please find some Parent Guides of the listed modules in the Download Section of the Datamath Calculator Museum.